Objective To provide an update on economic related inequalities in caesarean section rates within countries. Design Secondary analysis of demographic and health surveys and multiple indicator cluster surveys. Setting 72 low and middle income countries with a survey conducted between 2010 and 2014 for analysis of the latest situation of inequality, and 28 countries with a survey also conducted between 2000 and 2004 for analysis of the change in inequality over time. Participants Women aged 15-49 years with a live birth during the two or three years preceding the survey. Main outcome measures Data on caesarean section were disaggregated by asset based household wealth status and presented separately for five subgroups, ranging from the poorest to the richest fifth. Absolute and relative inequalities were measured using difference and ratio measures. The pace of change in the poorest and richest fifths was compared using a measure of excess change. Results National caesarean section rates ranged from 0.6% in South Sudan to 58.9% in the Dominican Republic. Within countries, caesarean section rates were lowest in the poorest fifth (median 3.7%) and highest in the richest fifth (median 18.4%). 18 out of 72 study countries reported a difference of 20 percentage points or higher between the richest and poorest fifth. The highest caesarean section rates and greatest levels of absolute inequality were observed in countries from the region of the Americas, whereas countries from the African region had low levels of caesarean use and comparatively lower levels of absolute inequality, although relative inequality was quite high in some countries. 26 out of 28 countries reported increases in caesarean section rates over time. Rates tended to increase faster in the richest fifth (median 0.9 percentage points per year) compared with the poorest fifth (median 0.2 percentage points per year), indicating an increase in inequality over time in most of these countries. Conclusions Substantial within country economic inequalities in caesarean deliveries remain. These inequalities might be due to a combination of inadequate access to emergency obstetric care among the poorest subgroups and high levels of caesarean use without medical indication in the richest subgroups, especially in middle income countries. Country specific strategies should address these inequalities to improve maternal and newborn health. Access to caesarean section is an essential component of obstetric care.123 The optimal caesarean section rate—that is, the percentage of births achieved by caesarean among all live births that results in the best possible health outcomes—is difficult to determine as it is challenging to ascertain the true medical need at the population level. Proposals for optimal caesarean section rates have ranged from 5% to 20%, capturing both minimal desirable levels for emergency caesarean section and those constituting overuse of elective caesarean section.45 Very low population level caesarean section rates are indicative of a lack of access to caesarean section for women in need and these contribute to maternal and newborn mortality and morbidity.678 At the other extreme, very high caesarean section rates point to high levels of caesarean use without medical indication, which may result in negative outcomes such as infection, haemorrhage, and surgical complications, exceeding the risks of vaginal deliveries.91011 With adverse consequences at both low and high levels of caesarean use, monitoring rates is important to understand trends in potential underuse and overuse and also to identify inequities in caesarean use. Inequities are the systematic differences in caesarean section rates between different population subgroups that are deemed to be unjust, unfair, and avoidable. While inequity is a normative concept that cannot be measured and monitored, inequality is a metric by which inequity can be assessed. Inequalities refer to the observed differences in caesarean section rates between different population subgroups.12 Measuring and monitoring inequalities in caesarean section use can help identify population subgroups that are at risk and track how changes in use are realised by different population subgroups. Measuring and monitoring inequalities can also help identify inequities in caesarean section rates and inform policy responses that are equity oriented. Both national and disaggregated data are important for monitoring caesarean section rates. While national averages are useful for assessing global trends and inequalities between countries, disaggregated data can help identify within country inequalities. Evidence shows that inequalities in caesarean section rates exist both between countries and within countries. A recent analysis of global trends in caesarean deliveries found an increase in all regions except sub-Saharan Africa, with the global average increasing from 6.7% in 1990 to 19.1% in 2014.13 At the country level, several studies also reported differences in caesarean section rates between different population subgroups, with the largest rates among the richest subgroups.141516171819 This was supported by two multi-country studies of 42 low and middle income countries and 26 countries in sub-Saharan Africa and southern Asia, respectively, which found extremely low rates of caesarean section among the very poor and persistent inequalities despite rising national rates.2021 Given this evidence suggesting large inequalities between and within countries, continued monitoring of caesarean section by population subgroups is important. We provide an update on economic inequalities in caesarean section rates within a large number of countries from all world regions and the change in inequality over time. We selected countries for inclusion based on data availability and survey year. To analyse the latest situation of inequality, this analysis draws on the latest available demographic and health surveys or multiple indicator cluster surveys conducted between 2010 and 2014 in 72 countries. To look at the change in inequality over time, we included data from surveys done 10 years earlier, between 2000 and 2004, which were available for 28 out of the 72 countries. Country income groups were determined based on the World Bank classification as of July 2017.31 Countries were grouped according to World Health Organization region.32 The appendix table provides a full list of all countries and surveys included in this study, with corresponding information about country income group and WHO region. We calculated disaggregated estimates according to economic status and presented results separately for five subgroups, ranging from the poorest to the richest fifth. We identified wealth fifths with likely underuse or overuse of caesarean section using cut-off points of 10% for the former and 15% for the latter. Thus we considered fifths with caesarean section rates of less than 10% to have a higher risk of underuse and fifths with rates of more than 15% to have a higher risk of overuse. These cut-off points, which have also been used in previous analyses,2033 are only indicative and not prescriptive since there is no consensus on the optimal rate or range for caesarean sections,5343536 and the risks associated with caesarean section will vary across countries. To show the latest status of absolute and relative inequality in each study country we used difference and ratio measures. We calculated absolute inequality by subtracting the caesarean section rate in the poorest fifth from the caesarean section rate in the richest fifth. 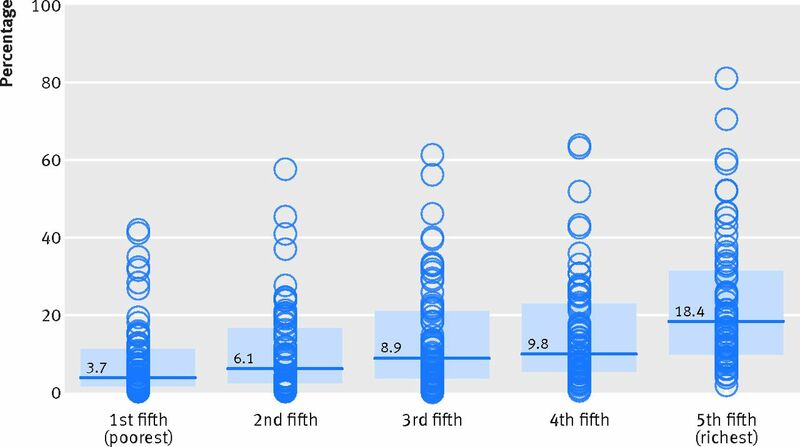 To calculate relative inequality, we divided the caesarean section rate in the richest fifth by the caesarean section rate in the poorest fifth. Using a correlation coefficient we assessed the association between absolute wealth related inequality in caesarean section and income inequality. The latter inequality was measured using the GINI index, which indicates the extent to which the distribution of income in a population deviates from a perfectly equal distribution.37 We obtained data about the GINI index from the World Bank.37 Results could be reported for 57 study countries, where GINI index data were available from the same year or from up to five years before the latest available demographic and health surveys and multiple indicator cluster surveys. Using data from the latest available demographic and health surveys and multiple indicator cluster surveys, we further disaggregated caesarean section data and calculated estimates by economic status for urban and rural areas separately. Data simultaneously disaggregated by economic status and place of residence were available and could be reported for 34 study countries. No patients were involved in setting the research question or the outcome measures, nor were they involved in the design and implementation of the study. No patients were asked to advise on interpretation or writing up of results. There are no plans to disseminate the results of the research to study participants or the relevant patient community. Caesarean section rates varied substantially both between and within countries (fig 1 and table 1). National averages ranged from 0.6% in South Sudan to 58.9% in the Dominican Republic. More than one third of study countries (n=25) reported national rates higher than 15%. The rates were highest for Argentina, Colombia, the Dominican Republic, and Egypt, where at least one third of children were delivered by caesarean. Three out of these four countries are located in the region of the Americas. However, half of the study countries (n=37) reported national rates of less than 10%, with four countries, all in the African region, reporting very low rates (<2%; Chad, Ethiopia, Niger, and South Sudan). Overall, caesarean section rates were lower in poorer women and tended to increase with rising economic status. The median caesarean section rate was 3.7% among women in the poorest fifth compared with 18.4% among women in the richest fifth. 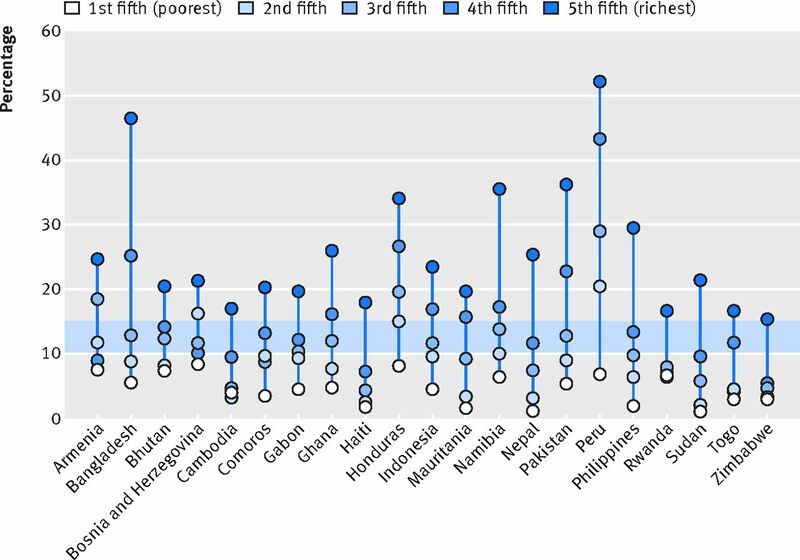 In general, the variation in caesarean section rates was wider between study countries in the richest fifth than in the poorest fifth (fig 1). Forty two countries (58%) reported rates of more than 15% in the richest fifth compared with 12 countries in the poorest fifth (17%). In 16 countries at least one third of women in the richest fifth had a caesarean section, while only three countries reported this rate for women in the poorest fifth (Egypt, Dominican Republic, and Serbia). Rates of less than 10% were reported for 19 countries (26%) in the richest fifth compared with 51 countries (71%) in the poorest fifth. In the richest fifth, caesarean section rates were less than 2% in only one country (South Sudan), whereas 20 study countries (28%) reported similarly low rates in the poorest fifth. In 21 countries (29%), rates in the poorest fifth were less than 10%, indicating underuse, while rates in the richest fifth were more than 15% indicating overuse (fig 2). In the four countries with national caesarean section rates of less than 2%, caesarean section rates were less than 2% in at least 80% of the population and less than 1% in the poorest 20% of the population. In 19 countries (26%), wealth related absolute inequality was substantial, with a difference in caesarean section rates between the richest fifth and poorest fifth of 20 percentage points or higher. In four countries, the difference exceeded 40 percentage points: Panama (48.6 percentage points), Costa Rica (48.2 percentage points), Peru (45.4 percentage points), and Bangladesh (41.0 percentage points). In 62 countries (86%), caesarean section rates were at least twice as high in the richest fifth than in the poorest fifth; and in 14 countries (19%), rates were at least 10 times as high in the richest fifth compared with the poorest fifth. In seven countries (10%) there was no evidence for absolute or relative wealth related inequality. Three of these countries were from the European region, where caesarean section rates were higher in the poorest fifth than in the richest fifth: Belarus (−6.8 percentage points), Republic of Moldova (−1.9 percentage points), and Serbia (−1.7 percentage points). When we looked at national average and absolute wealth related inequality simultaneously, we found a clustering pattern of countries by world region (fig 3). While most study countries from the region of the Americas had high national averages and high absolute wealth related inequalities in caesarean section rates, countries from the African region tended to have low national averages and low absolute wealth related inequalities. In both regions, however, there were exceptions, such as Haiti with a low national average (5%) and Ghana and Namibia with high absolute wealth related inequality (difference of 21.2 and 29.2 percentage points, respectively). In the European region, most study countries showed low or no absolute wealth related inequality, whereas in South-East Asia and Western Pacific regions, most study countries showed moderate or high absolute wealth related inequality. No clear pattern could be observed for countries from the Eastern Mediterranean region. When we compared the level of income inequality with the level of absolute wealth related inequality in caesarean section in 57 study countries, we found that countries from the region of the Americas also showed larger levels of income inequality, and countries from the South-East Asia, European, Eastern Mediterranean, and Western Pacific regions showed lower levels of income inequality (fig 4). However, the correlation between income inequality and absolute wealth related inequality in caesarean section was low (correlation coefficient=0.33). Further disaggregation of caesarean section data in 34 study countries showed that caesarean section rates tended to increase across wealth fifths in both urban and rural areas, with higher rates in urban areas in corresponding wealth fifths (table 2). In particular, Panama showed a much steeper gradient across fifths in urban areas (11.3% in the poorest fifth v 62.1% in the richest fifth) than in rural areas (10.2% v 29.8%). On the contrary, the Honduras reported a much steeper gradient across fifths in rural areas (7.6% v 38.9%) than in urban areas (13.0% v 33.4%). In Namibia, caesarean section rates were very high in the richest fifth overall (35.5%), but double disaggregation revealed a much lower rate among the richest residing in rural areas (14.7%) compared with urban areas (36.8%). In Zambia, the caesarean section rate among the richest fifth was higher in rural areas (16.9%) than in urban areas (10.3%). Twenty six out of 28 countries (93%) included in the change-over-time analysis reported increases in national caesarean section rates (table 3). These were largest for Egypt and the Dominican Republic, where the national rate increased by more than 2 percentage points each year (3.1 and 2.3 percentage points, respectively). There was no evidence for a change in caesarean section rates in two countries (7%): Nigeria and the United Republic of Tanzania. Overall, the number of countries with national caesarean section rates of more than 15% increased from four countries in 2000-04 to seven countries in 2010-14, whereas the number of countries with rates of less than 10% decreased from 23 to 16. Similarly, there was a decrease in the number of countries with very low rates: only two out of eight countries with rates of less than 2% in 2000-04 still reported these rates in 2010-14 (Chad and Ethiopia). Most countries also reported increases in the richest fifth, and many countries reported increases in the poorest fifth. Among the richest fifth, Bangladesh showed the largest change in caesarean section rates (3.5 percentage points per year), while the Dominican Republic had the highest caesarean section rates in both years (54.0% in 2002 and 81.1% in 2013). Among the poorest fifth, Egypt reported the largest increase in caesarean section rates, of 2.7 percentage points per year, resulting in the highest caesarean section rate in 2010-14 (4.1% in 2000 and 42.0% in 2014). Eight out of 18 countries with caesarean section rates of less than 2% in the poorest fifth in 2000-04 achieved rates of more than 2% in 2010-14, with five countries reporting substantial increases in the poorest fifth: Bangladesh (0.1% to 5.4%), Cambodia (0.2% to 3.9%), Ghana (1.5% to 4.7%), Indonesia (1.1% to 4.4%), and Rwanda (0.9% to 6.6%). Caesarean section rates tended to increase faster in the richest fifth than the poorest fifth. The largest difference in the pace of change was observed for Bangladesh, where the increase in the richest fifth outpaced that of the poorest fifth by 2.8 percentage points per year. On the contrary, three countries reported an increase in the poorest fifth that was at least as fast as the increase in the richest fifth, if not faster (Benin, Colombia, and Jordan). Among the eight countries with national rates below 2% in 2000-04, gains in caesarean section rates mostly occurred in the richest fifths. In the six countries where national rates increased to more than 2% by 2010-14, caesarean section rates in the poorest fifth remained less than 2% in all but one country (Cambodia). In Nepal for example, the national caesarean section rate increased from 1% in 2001 to 8.6% in 2014; however, the change among the poorest fifth was from 0.3% to 1% compared with 4.2% to 25.8% in the richest fifth. 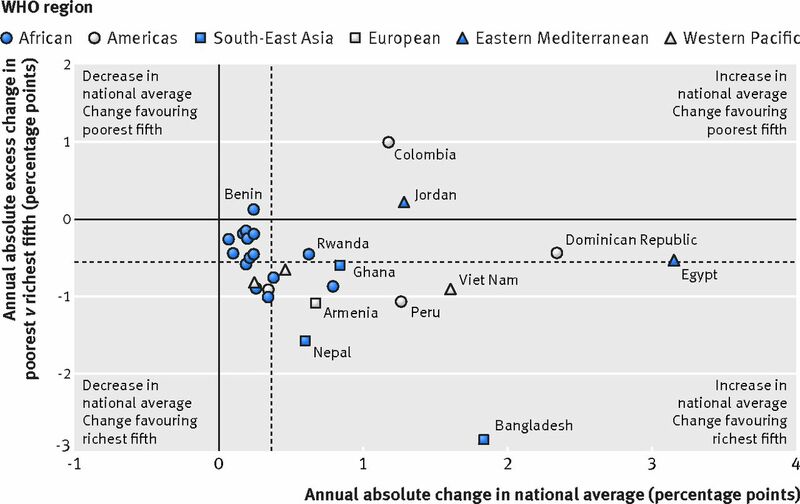 Considering the difference in the pace of change between fifths alongside the change in national average, we found a clustering pattern of study countries from the African region where most study countries reported low or no change in the national average over time; only Ghana and Rwanda reported an absolute increase of more than 0.5 percentage points per year (fig 5). Our data show that caesarean section rates increased in most countries during the past decade, particularly among the richest fifth, indicating an increase in wealth related inequality over time. Caesarean section rates were lower in poorer fifths, where they were more likely to be lower than 10%, and higher in richer fifths, where they were more likely to be higher than 15%. The level of caesarean section rates and the degree of within country inequality varied greatly across countries, with several distinct regional patterns. 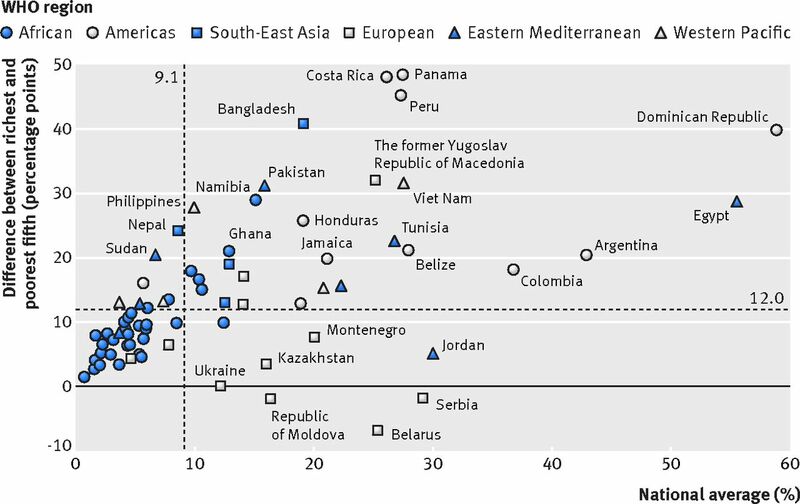 Similar to previous studies, the highest caesarean section rates and the greatest levels of absolute inequality were observed for Latin American countries.1339 Latin America is also the region with the highest combined income inequality40; however, among study countries, the association between income inequality and wealth related inequality in caesarean section was weak. In the African region our results confirm the presence of low caesarean section rates across all wealth fifths and small absolute inequalities.132021 In contrast, we identified three European countries with higher caesarean section rates in the poorest fifth than richest fifth. Further country specific studies are needed to understand this departure from global trends. The reasons for varying caesarean section rates both between and within countries are complex and context specific. Low levels of caesarean section may be due to lack of skilled health staff and health infrastructure, the existence of user fees, or cultural beliefs around the value and safety of caesarean section.41424344 Overuse of caesarean section is driven by a complex interplay of factors at individual, societal, and organisational levels. At the individual level, fear of pain during childbirth, cultural beliefs around luck and fate of birth dates,454647 and the impact of vaginal delivery on cosmetic appearance, pelvic floor, and sexual functioning may influence women’s preference and choice.464748 Furthermore, cultural and societal perceptions around prestige may drive maternal requests for caesarean section.474950 At the organisational level, convenience for health professionals, financial incentives, fear of litigation, medicalisation of the birth process, cultures of clinician staffing, and the physical layout of health facilities have been shown to influence the overuse of caesarean section.51 An understanding of country level dynamics, local cultural practices, and specific barriers and facilitators of access is key to developing country appropriate approaches to tackling underuse as well as overuse of caesarean section. Important lessons may be learnt from countries that have increased caesarean section rates among the poorest fifth, even though rates for this subgroup still fall short of 10% (Bangladesh, Cambodia, Ghana, Indonesia, and Rwanda). A common theme for all these countries is a strong governmental focus on maternal and newborn health along with policy changes that reduce financial barriers to access for the poorer subgroups. In Bangladesh, maternal health is a nationwide priority, with a focus on improving access to quality care in remote areas. The Demand Side Financing scheme launched in 2007, along with free maternity services, provides financial incentives for clients and providers for institutional delivery, covering normal and caesarean childbirth. However, the training of community female health workers to overcome the shortage of skilled birth attendants was ineffective, and the high proportion of home births using unskilled attendants remains a key challenge.5253 In Cambodia, health policies expanding access to services for poor people have contributed to increased coverage with maternal and newborn indicators.54 Policy changes included user fee exemptions and health equity funds that provide health insurance for the poor at primary and tertiary levels, with reimbursement of healthcare providers for services delivered to those identified as poor.54555657 In Ghana, the national policy to exempt women from paying for delivery care introduced in 2004 was successful in improving coverage and outcomes and in reaching poor women.5859 In 2004, Indonesia started the implementation of a government financed health insurance programme for poor people, which was expanded in 2008 to include near-poor people, and the Jamkesmas is currently the largest social health insurance programme in the country. Although this programme does not overcome all the barriers, evidence shows that membership to Jamkesmas can reduce some financial barriers.60 Since the humanitarian crisis in 1994, Rwanda’s government prioritised reproductive, maternal, and newborn health as part of decentralisation and strengthening of the health system.61 A community based health insurance scheme helped lower out-of-pocket payments and ensure better access for vulnerable populations, and a performance based financing system contributed to boost the use of maternal and child health services.6162 These country examples point to the potential impact of policies targeting demand side, and, in particular, financial barriers. Targeting caesarean section rates at the national level requires sensitive and complex considerations. Firstly, it is widely accepted that both overuse and underuse of caesarean section can carry increased risks of adverse maternal and perinatal outcomes.62863 Thus, unlike other intervention indicators such as antenatal care or skilled birth attendance, the caesarean section target is not universal coverage. This may explain some of the difference in patterns between caesarean section rates and other coverage indicators for which inequalities are being reduced as the rich attain universal coverage.25 Secondly, striving to achieve an optimal caesarean section rate at the national level may be misleading as it may not ensure that all women who have a caesarean section need it, nor that all women who need a caesarean section receive one, as is suggested by the wide social inequalities we reported for many countries.764 Nevertheless, we propose that the cut-off points of 10% and 15% are useful to identify population subgroups at risk of underuse and overuse, based on the most recent evidence. A 2015 systematic review of eight studies concluded that population level caesarean section rates above thresholds of 9% to 16% were not associated with reduced mortality.35 A more recent global ecological study suggested that rates higher than 10% were not associated with decreases in maternal and newborn mortality,36 whereas another study concluded that rates of less than about 19% were associated with lower mortality.5 Another analysis of exclusively high income countries showed that population level rates above thresholds of 10% to 15% were hardly justified.4 However, most of the analyses conducted to date have not been able to assess the link between maternal and newborn morbidity and population level caesarean section rates, which is a critical limitation for determining an optimal rate. Our cut-off points of 10% and 15% were not selected to suggest an ideal rate or range, but rather for pragmatic reasons to identify countries where underuse and overuse of caesarean section coexist in different population subgroups. The main strengths of our study include the large number of countries with nationally representative data and with standardised and comparable definitions and methods. Reported information on caesarean section rates from household surveys is reliable,2829 allowing for consistent comparisons of within country inequalities across countries over time. We acknowledge several study limitations. Firstly, this study does not cover all countries in all world regions and, because of lack of recent national survey data, does not include some of the countries with the highest caesarean section rates in the world, such as China and Brazil. Secondly, data from the demographic and health surveys in this study are based on a recall period of three years, whereas data from the multiple indicator cluster surveys are based on a recall period of two years before the survey. Thirdly, we used the latest data available from the demographic and health surveys and multiple indicator cluster surveys, but for some countries current rates may already be higher. Fourthly, our study investigates wealth related inequality but does not adjust for other relevant factors, such as education or place of residence. Finally, although assessing wealth related inequality in rural and urban areas separately can help provide an initial understanding of inequality patterns, indepth country specific studies are required to break down wealth related inequality in caesarean section and explain its determinants.68 Further analyses are also required to assess caesarean section rates in public and private health facilities. If there are no inequalities in facility level caesarean section rates, population level inequalities are likely due to differences in access to facilities between different population subgroups. For example, in Bhutan there was a considerable gradient in caesarean section rates in the population across wealth fifths (difference of 13.1 percentage points between the richest and poorest fifth); however, no wealth related inequality could be observed in caesarean section rates in health facilities, where about one fifth of deliveries were by caesarean section, regardless of wealth. Equity is a prominent part of the sustainable development goals agenda, and the vision of a world with equitable and universal access to quality healthcare also concerns caesarean section. However, our analysis of wealth related inequalities in caesarean section rates shows that considerable inequalities remain both between and within countries. Continued measuring and monitoring of inequalities in caesarean section rates will be important to detect differences between population subgroups and identify subgroups with potential underuse or overuse. Policy makers should clearly differentiate between subgroups and invest in targeted policies and strategies to ensure equitable access to caesarean section and improve maternal and newborn health for all. Contributors: AAB and AS contributed equally to this study and are the guarantors. ARH conceived and designed the study with inputs from AAB, APB, and ABM. AS, AJDB, and ARH analysed and interpreted the data. AAB and AS drafted the manuscript with inputs from APB, ABM, and ARH. AJDB, TB, MRT, and CV critically commented and provided revisions to the manuscript. All authors read and approved the final manuscript. The authors alone are responsible for the views expressed in this article and they do not necessarily represent the views, decisions, or policies of the institutions with which they are affiliated. Funding: This study received no specific funding. Data sharing: Data from the demographic and health surveys and multiple indicator cluster surveys are freely available at http://dhsprogram.com/ and http://mics.unicef.org/. The disaggregated data presented in this study, derived from reanalysis of publicly available demographic and health surveys and multiple indicator cluster surveys microdata, are available through the WHO health equity monitor database at http://apps.who.int/gho/data/node.main.HE-1540?lang=en. Transparency: The lead authors (AAB and AS) affirm that this manuscript is an honest, accurate, and transparent account of the study being reported; that no important aspects of the study have been omitted; and that any discrepancies from the study as planned (and, if relevant, registered) have been explained. This is an Open Access article distributed under the terms of the Creative Commons Attribution IGO License (https://creativecommons.org/licenses/by-nc/3.0/igo/), which permits use, distribution, and reproduction for non-commercial purposes in any medium, provided the original work is properly cited.
. Maternal Health and Safe Motherhood Programme. Mother-baby package: implementing safe motherhood in countries.World Health Organization, 1996.
. WHO, UNFPA. Guidelines for monitoring the availability and use of obstetric service.United Nations Children's Fund, 1997.
. UNFPA, UNICEF, AMDD. Monitoring emergency obstetric care: a handbook.World Health Organization, 2009.
. National health inequality monitoring: a step-by-step manual.World Health Organization, 2017.
WHO. Global Health Observatory: Health Equity Monitor. Geneva: World Health Organization; 2016 [cited 2017 18 January]. www.who.int/gho/health_equity/en/. UNICEF. Statistics and monitoring: Multiple Indicator Cluster Surveys (MICS). New York: United Nations Children's Fund; 2014 [cited 2017 18 January]. www.unicef.org/statistics/index_24302.html. USAID. The DHS Program: Demographic and Health Surveys. Rockville: USAID; 2013 [cited 2017 18 January]. http://dhsprogram.com/.
. State of inequality: reproductive, maternal, newborn and child health.World Health Organization, 2015. USAID. The DHS Program: wealth index. Rockville: USAID; 2014 [cited 2017 18 January]. http://dhsprogram.com/topics/wealth-index/Index.cfm. World Bank. World Bank country and lending groups Washington DC: The World Bank Group; 2017 [cited 2017 30 August]. https://datahelpdesk.worldbank.org/knowledgebase/articles/906519-world-bank-country-and-lending-groups. WHO. WHO Regional Offices. Geneva: World Health Organization; 2016 [cited 2017 18 January]. www.who.int/about/regions/en/.
. The global numbers and costs of additionally needed and unnecessary caesarean sections performed per year: overuse as a barrier to universal coverage. World Health Report 2010, Background Paper, No 30.World Health Organization, 2010.
WHO. WHO statement on caesarean section rates. Geneva: World Health Organization; 2015 [cited 2017 18 January]. http://apps.who.int/iris/bitstream/10665/161442/1/WHO_RHR_15.02_eng.pdf?ua=1. World Bank. DataBank. World Development Indicators. 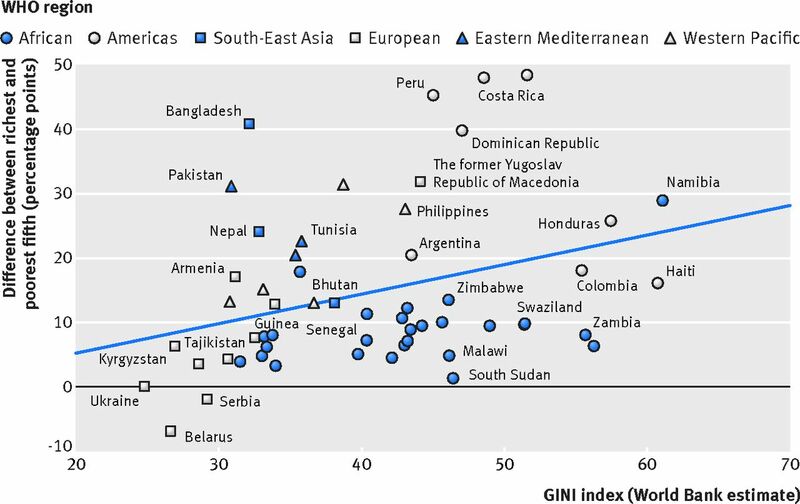 GINI index (World Bank estimate). Washington DC: The World Bank Group; 2017 [cited 2017 20 November]. http://databank.worldbank.org/data/reports.aspx?source=2&series=SI.POV.GINI. National Cancer Institute. Health Disparities Calculator, Version 1.2.4 - October 29, 2013. Bethesda; Division of Cancer Control and Population Sciences, Surveillance Research Program and Healthcare Delivery Research Program, National Cancer Institute; 2013. Ortiz I, Cummins M. Global Inequality: Beyond the bottom billion - A rapid review of income distribution in 141 countries. UNICEF Social and Economic Policy Working Paper. New York: United Nations Children’s Fund; 2011. Allin S, Baker M, Isabelle M, Stabile M. Physician incentives and the rise in c-sections: evidence from Canada. NBER Working Paper No 21022. Cambridge: National Bureau of Economic Research; 2015.
. An analysis on maternal healthcare situation in Bangladesh: a review. Divers Equal Health Care2016;13:360-4.
. Health Bulletin 2013.Government of the People’s Republic of Bangladesh, Directorate General of Health Services, 2014.
. National Health Strategic Plan 2008-2015.Royal Government of Cambodia, 2008.
. Fast Track Initiative Road Map for Reducing Maternal and Neonatal Mortality 2010-2015.Royal Government of Cambodia, 2010.
. National Social Protection Strategy for the Poor and Vulnerable.Royal Government of Cambodia, 2011. Worley H. Rwanda’s Success In Improving Maternal Health Washington DC: Population Reference Bureau; 2015 [cited 2017 20 November]. www.prb.org/Publications/Articles/2015/rwanda-maternal-health.aspx.